The chilly season in New England brings on a strong yen for soup, muffins right out of the oven, and a cracking fire in an open fireplace. 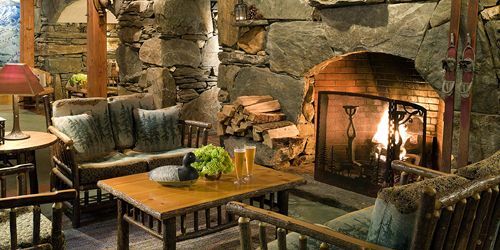 It is no surprise that many New England restaurants -- from neighborhood pubs to white-tablecloth establishment -- have a wood fire burning in open fireplace to keep guests warm and cheery. Find one below and make a plan to enjoy it. Remember Valentine's Day, which lands right in the middle of the winter. Romance is even better near a fireplace! Located on the waterfront in Fall River, near the Narrows Center for Arts, Battleship Cove and The Marine Museum at Fall River. So it’s a natural place to stop in for lunch or dinner before or after visiting these standout places. This is a casual dining room and pub with a fun, two-story open layout that allows all diners to enjoy the fireplace and live acoustic entertainment. Enjoy hearty dishes of all kinds, from nachos to mussels to tasty salads. Weekly specials include Wine & Dine on Mondays, prime rib on Wednesdays, and Martinis & Meatballs on Thursdays. Open daily, starting at 4 p.m. weekdays, and at noon Friday to Sunday. 75 Ferry Street in Fall River. 508-567-0550. Menu. Map. 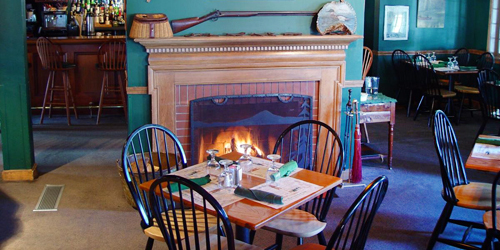 This comfortable eatery with muted lighting and a crackling fire in the fireplace is noted for its extreme hospitality. The restaurant looks directly into a room of gleaming tanks and barrels where the wine of the adjacent vineyard is produced. A summer dinner overlooking the vineyard feels green and airy; a winter repast is cozy and warm. Meals are made entirely from scratch and paired with estate-grown wine and Taproot beer. For lighter hunger, try the artisanal cheese boards and small plates and farm-focused entrees. Lunch is served in the brewery Taproom. Open Wednesday-Saturday. 909 East Main Road, Middletown. 401-848-5161. Dinner menu. Map. 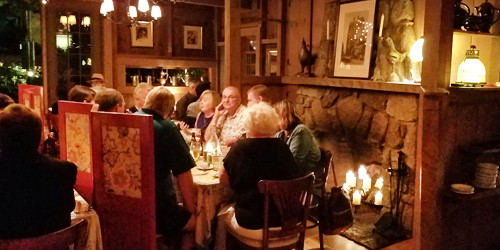 The two dining spaces at the Pitcher Inn are for special occasions, especially if you appreciate the nuances of fine wines. The main Dining Room presents a Relais & Châteaux fine dining experience, using seasonal ingredients to create an elevated farm-to-table meal. Wine Spectator honored the Inn with its Best Award of Excellence for the Inn’s 500-bottle cellar. The Dining Room feels elegant, with cherry tables and a leather Chesterfield sofa overlooking the village. The other dining space, Tracks, is more casual, with a backcountry décor and living-room seating. Open daily except Mondays and Tuesdays. 275 Main Street, Warren. 802-496-6350. Dinner menu. Map. Located right on the harbor front, within easy sight of the docks and movement of boats, Boone’s Fish House & Oyster Room has been in business since 1898, serving its original baked stuffed lobster, oysters and wood fire grilled entrees. 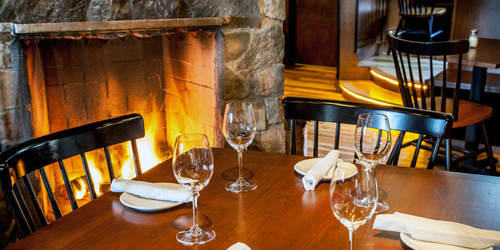 Clearly a winter or a summer spot, Boone’s welcomes guests in winter to enjoy its fine seafood by a cozy wood-burning fireplace. (Maybe reserve the outdoor porch seating and salt breezes for summer.) Baked stuffed lobster is the place’s signature dish, but other entrees are available, including the raw bar, with freshly shucked Maine oysters. Open daily. 86 Commercial Street, Portland. 207-774-5725. Menu. Map. 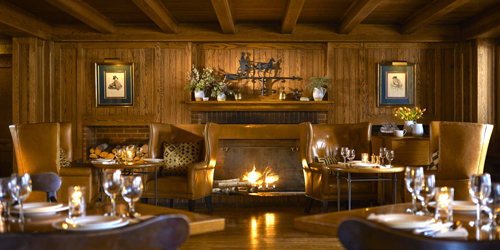 The warmth of the wood-paneled Richardson’s Tavern with its wide, wood-burning fireplace is matched by the idealism that the Inn’s chefs bring to the cookery here. Dishes are prepared from scratch with ingredients sourced by the Inn’s master gardener at local farms. Richardson’s serves dinner daily, accompanied by local craft brews and spirits. 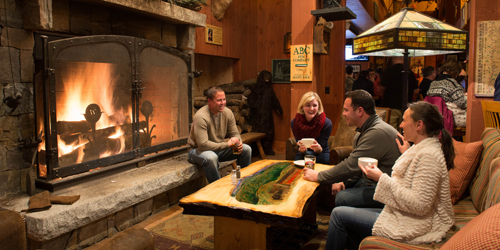 The relaxed atmosphere invites warm conversation, and the oversized lounge chairs by the fireside are divine. Open daily for dinner, 5-9 p.m., and Sundays from brunch 11 a.m. to 2 p.m. Brunch in this dozy tavern is leavened by live acoustic jazz. The Green, Woodstock. 802-457-6640. Dinner menu. Map. 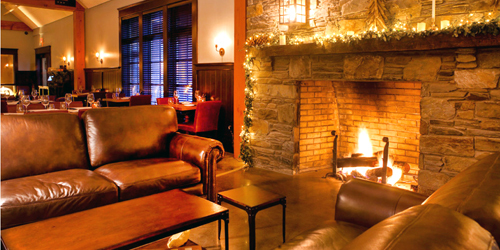 At this deluxe, traditional New England inn, guests have not just one, but three, restaurants, from formal to casual, to enjoy an open fire place while dining or enjoying drinks at cocktail hour. 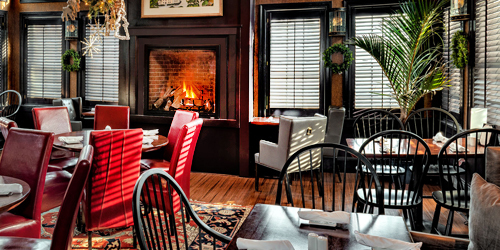 The Dining Room is seven restored dining rooms, where modern New England cuisine is served daily for lunch and dinner, as well as brunch every Saturday and Sunday. The Tavern is a laid-back pub with brass foot rails at the bar, upholstered chairs, rich oak floors, and Americana art. Lunch and cocktail hour. The Lobby Bar is shamelessly comfortable. Enjoy a beautiful wine selection. Open daily after 4 p.m. 2 Olde Bedford Way, Bedford. 800-852-1166. Dinner menu. Map. 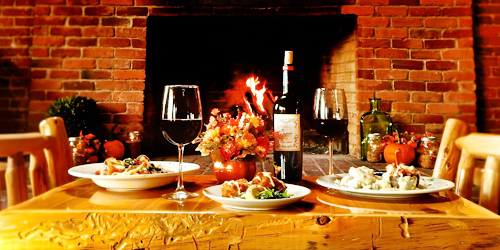 Not far from Old Sturbridge Village, Publick House Historic Inn, a member of Historic Hotels of America, offers traditional New England dining in the Tap Room or Ebenezer’s Tavern. With a post-and-beam ceiling above and wide plank floors below, the warm Tap Room is the Inn’s original dining room. Its centerpiece is a six-foot-wide fireplace. Enjoy Yankee pot roast or pan-roasted salmon. Ebenezer’s Tavern was named after the inn founder, who entertained Revolutionary troops. Sink into wingback chairs or couches by the fireplace. Next to the tavern is the irresistible Bake Shoppe. 277 Main Street, Sturbridge. 508-347-3313. Dinner menu. Map. The co-owners of Roost, with several decades of combined experience as restaurateurs, take great pride in the establishment and share the kudos with their chefs. The head chef brings his interpretation to regional and international cuisine. Entrees and appetizers are hand-crafted, using classical cooking techniques with contemporary flavors. Customers rave about the warmth and hospitality of the staff. The setting is fun: guests enter through French doors into a space that was once a large carriage house. Open for breakfast, lunch and brunch, Friday to Sunday; open for dinner Wednesday to Sunday. 262 Shore Road, Ogunquit. 207-646-9898. Menu. Map. Located on Route 1, close to the L.L. 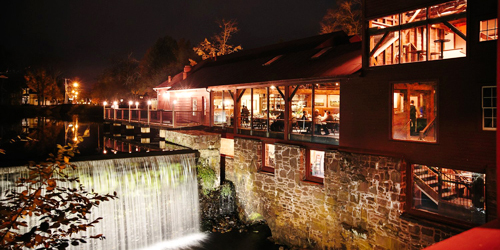 Bean flagship store, the Harraseeket River, and an Audubon sanctuary, Harraseeket Inn serves meals, a breakfast buffet, and even afternoon tea in two venues, the Maine Dining Room and the Broad Arrow Tavern. The Tavern, with its open kitchen and wood-fired oven and grill, serves lunch and dinner. The exclusive Maine Harvest Series is one-occasion meals with a focus on seasonal dishes and the perfect pairings. Sunday brunch, voted Best Brunch in Maine by Down East Magazine reader, includes fresh Maine lobster. Open daily. 162 Main Street, Freeport. 207-865-9377. Menu. Map. The Warren Tavern is genuinely historic; it’s oldest tavern in Massachusetts and was visited by historic figures like George Washington and Paul Revere. At the same time, this eatery is very much alive and dynamic in the present. Located on the cozy streets of Charlestown, The Warren Tavern is a staple for Charlestown residents and a place for visitors to see Bay Staters in their daily lives. 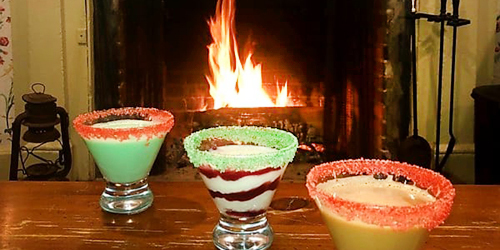 The menu is haute pub, with creative entries like the Jalapeno pretzel Sam Adams cheese, buffalo chicken Arancini; baked haddock, seafood DiAblo and Cajun salmon tacos. Open daily 1 a.m. to 1 a.m. 2 Pleasant Street, Charlestown. 617-241-8142. Lunch and dinner menu. Map.